The gorgeous cover shows two women dancing together, one of whom is wearing a tux. Swoon! And the structure of this novel is ingenious, with a modern day frame story bracketing the 1940 portions. And there is even a touch of magic in it as well. I adored every single word. The ending is a bit madcap, but in the most perfect, fitting way. A totally enjoyable reading experience from start to finish! I'm sending this to another BookCrosser who has it on her wishlist. Enjoy! Thank you so much for the wishlist rabck!! I am excited to read this novella as I've heard great things about it. Incidentally, I heard Ellen Klages speak at SF in SF (Science Fiction in San Francisco) in June of this year at the American Bookbinders Museum in downtown SF. Ms. Klages was a phenomenal speaker... 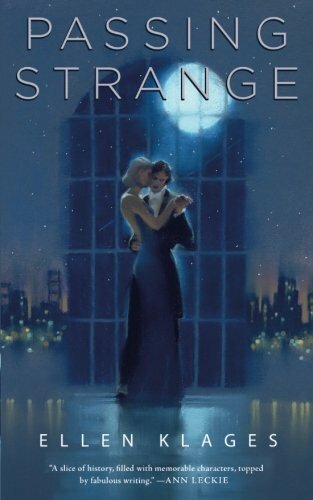 I had her sign three of her novels for me at the SF in SF event, but regretted not obtaining a copy of Passing Strange to have signed at the event as well. I read this novella in three days. I enjoyed the storyline, the characters, and writing quite a bit. The ending, although funny, left me wondering what really happened to Haskel and Emily?? I left this inside a Little Free Library.